Nutella or Baileys Chocolate Truffles... You Choose! Ok Mums, we’ve done it. The last few weeks has taken its toll and we just can’t do it anymore. Today we are de-kidifying (is that even a word?) our blog and making all about you! We’ve taken the Weetbix bars, the healthy homemade muesli bars and the kid friendly choc chip cookies and raised you one. I don’t know about you, but it seems everything in my social media news feed lately is all about the kids. Make this with the kids. Bake these yummy treats with the kids. You know what, as much as I LOVE making and baking with my kids, I want a break. Back to school means me time and as Mums, we darn right deserve some quality me time! After all, we did the hard yards and now we can sit back and rejoice in the fact the kids made it back to school in one piece. So, to Mums everywhere, this one’s for you. Sit back, grab a coffee, a good book or trash mag (it’s ok, no judgement here) and indulge in the easiest Baileys Chocolate Truffles you will ever make. Now, we don’t pretend these are healthy for you so don’t worry about finding the coconut oil or Rice Malt Syrup here. It’s all about the treat. Oh, and stick around because you can turn these beauties into Nutella Chocolate Truffles quicker than your kids can disappear in a supermarket. Well… Baileys for a start! ¼ Cup Desiccated Coconut - plus extra for coating. Pour yourself a shot of Baileys and drink. Add Marie biscuits to your blender and blend until almost powder. The finer the better. Place blended biscuits into a mixing bowl and add all wet ingredients. 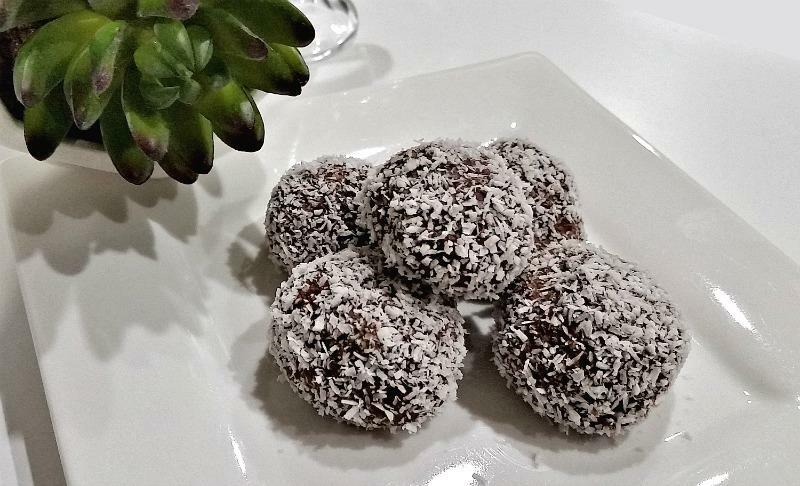 Add in ¼ cup of coconut or desired amount to achieve a sticky mix that will easily roll into balls. Roll mix into balls (slightly smaller than golf ball size or bite size) and coat in leftover coconut. Place balls into the fridge. Truffles will keep for 2 - 4 days but we are pretty sure they won’t last that long so don’t worry about that! Obviously you can make these truffles kid friendly by eliminating the Baileys and adding 1 teaspoon of vanilla essence instead. But as we said, the kids have had enough attention lately, it’s our turn. Melt white chocolate and dip the top of the truffle in chocolate and decorate with small slices of cherry for a Christmas touch. Baileys can be substituted for Rum to make Rum Balls. Nutella! Add 2 heaped tablespoons for a delicious hazelnut treat. Biscuit substitute - Choc ripple biscuits give a very rich flavour, but use slightly less sweetened condensed milk and more coconut. You will also need to refrigerate for 30 minutes before rolling as the mix will be a lot softer.